The days leading up to Christmas are some of the most grueling and most stressful days at the border post between Zimbabwe and South Africa. One certainly has to factor in the time they will be spending at the border when they embark on a journey back home, to either country, during the Christmas season. On a good day, one will spend five hours at the border post around this time. What remains evident at first sight at these posts, is the long stretch of buses queuing from beginning to end. These buses stretching from the entrance of the immigration center to miles back. This is a queue of Zimbabwean people seeking to return home to South Africa and see their loved ones after spending months in a country that is not their own. Some are professionals, whilst others are self-employed and seek to make a profit from selling goods during the Christmas season to feed their families. For the fortunate few who can afford to, they purchase a return ticket and fly back home––the easier method of transport. This state of affairs reveals a crucial point about Zimbabwe: Zimbabwe is facing an emigration crisis. At different points in time, Zimbabwe has experienced a mass exodus of people leaving the country in search of a better life overseas. Many of them are parents who want to feed their family and pay for their children’s education, and thus make the painful sacrifice of leaving their family to work abroad. Many others are students who have no job prospects in Zimbabwe, and seek to have an education elsewhere and get a job. The communitarian philosophy that undergirds many Zimbabwean families means that even when these individuals have the opportunity to disappear elsewhere, they have to contribute to the wellbeing of their immediate family and their relatives. The causes of Zimbabwean emigration are of no secret. One of the major mass exoduses was the period during and shortly after the 2008 crisis. Unemployment was estimated at 80%, inflation skyrocketed to 100,580% in February 2008. Chatham House in 2012 estimated that about 4 million Zimbabweans are scattered worldwide living in the diaspora. Crush and Tevera in their research, estimate that by 2008, the number of people crossing into South Africa reached 1.25 million. The conditions in Zimbabwe boiled ripe for a mass exodus at the time. Unfortunately, this mass exodus ran in congruence with the xenophobic violence that spread across South Africa during and after 2008. Some argue that indigent South African citizens felt that foreigners were depriving them of their jobs, and thus needed to be forced out of the country by any means necessary. 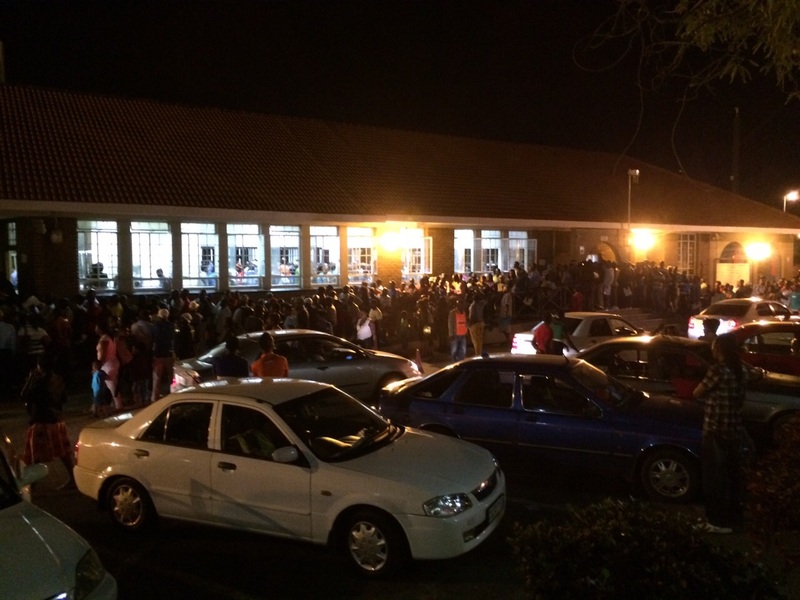 The extent of the xenophobic violence and how brutal the effect of it was is debatable. However, what does not change is the fact that many Zimbabweans faced the possible paradox of choosing between a rock and a hard place- suffer the living conditions in Zimbabwe, or face the threat of xenophobia in South Africa. Logically, the willingness for Zimbabweans to return is deterred by the continued economic crisis, alleged electoral rigging, and poor living conditions up until the present time. In a study by Pieter Frederick Janse van Vuuren, he argued that the continual mass exodus has periodically been occurring since 1997 as the political and economic situation continued to deteriorate. Crush and Tevera in their report found that from the time period between 2003 and 2009, when asked about reasons for leaving, most of the study group said that their reasons for leaving the country were economic. Van Vuuren labels this period ‘the great exodus’, reaching the area of 3-4 million people. What must be noted further, is that the study group ranged from migrants in Britain to migrants in South Africa. This shows a clear connection between Zimbabwean migrants irrespective of where they migrated to. Meaning, they all had the same motive. This has led to what many scholars call a massive “brain drain” in Zimbabwe. “Brain drain” entails a loss in human capital, and presents several constraints on economic development. It can either be human resources leaving to go overseas, or to go and work in other countries in the region, such as Botswana. By 2010, as estimated by David Coltart, about 45,000 teachers left Zimbabwe in search of greener pastures. Even as early as 2005, Zimbabwe began experiencing a crisis with regards to medical health professionals. All of this data provides an overwhelming amount of evidence, which illustrates that linked to emigration and diaspora is a massive brain drain. This brain drain contributed extensively to the economic issues Zimbabwe faces because there are not enough professionals in the country tackling the difficult task of economic resurrection head on. Further, it is not just that people left overseas in search of better living conditions, but that there was a negative stigma attached to being a practicing professional in Zimbabwe. During my secondary schooling, it was almost entirely assumed that students would go overseas to pursue their degrees once they finished high school. Conversations centering on University of Zimbabwe, or other Zimbabwean universities were scant. Many of us grew up to think that being successful meant going to America, the UK, or Australia. And that only birthed a generation that sought to leave home in search of a better life. There are many exceptions to this observation, however the point remains the same. What shall we make of the situation as of present? A recent article by Forbes illustrates that Zimbabwe has entered another period of hyperinflation. This situation has created widespread panic and anxiety in the hearts of many Zimbabweans. So much so that currently, many shops face the issue of a buying frenzy wiping out all of their stock. Such an economic environment does not spell well for the country’s hopes in terms of the return of the diaspora. Many of them feel discouraged to come home when they take cognisance of what is going on back home, or hear from their families. Unfortunately, in the meanwhile, families will remain torn apart, and many in the diaspora will continue to face hardship and stress in search for a better life for themselves and their families. The need for the brain drain problem to be fixed is inextricably linked to the need for Zimbabwe to resurrect its economy. All Zimbabweans can hope for in the present moment is that the Mnangagwa administration takes this opportunity to make history and change the legacy created by the previous regime. At the very least, make progress that leaves the gap open for the baton to be passed to the next presidency to build on the foundation hopefully laid by President Mnangagwa. In the meantime, all we can hope for is that Zimbabwe’s diaspora travels “far, far away”, and we as Zimbabweans find the financial security and prosperity that we are searching for.